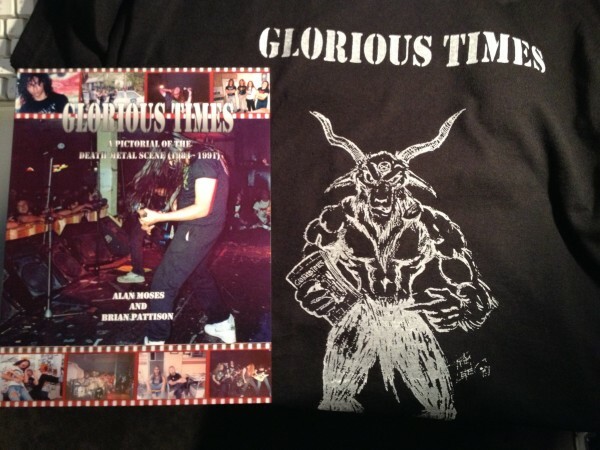 Kam Lee, former vocalist of Mantas/Massacre and former editor of Comatose Zine, has contributed art for the official Glorious Times tshirts printed for fans of the book and the time period. The shirts are white print on black and feature the Glorious Times stencil logo and art on the front. We have covered Glorious Times in the past, but for the newcomer, it is a book of retrospectives by people who were active in the death metal underground from 1984 to 1991, which were the formative years of the genre and its earliest internal differentiation. 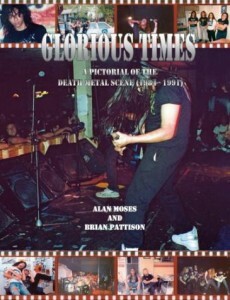 Featuring many rare photos and perspectives, Glorious Times helped kick off the current retrospective view of the old school death metal scene that has brought many bands out of hiding and seen many classic recordings and publications re-issued. For a sample of Glorious Times, download the Nuclear Death profile and read our update on version 2.0 of the book as well as our original article calling attention to the great work that Alan Moses and Brian Pattison are doing with Glorious Times and their help for the underground metal scene. Then consider buying a tshirt to support! The guys behind Glorious Times, the book that helped many rediscover the early death metal and black metal underground, are presenting the latest in their series of classic death metal concerts named after the original “A Day of Death” back in 1990. Unfortunately, this one is also the last they’re going to do of this series. Like many shows, this has brought several bands out of retirement. This will be the first show of Baphomet/Banished, famous for their brooding chunky heavy metal, and bands such as Sin-Eater who have been inactive until this time. 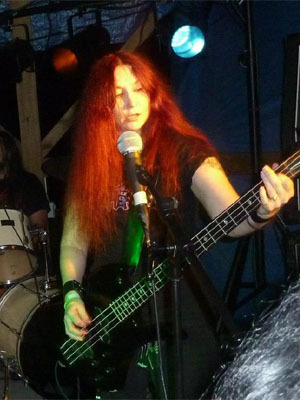 As you may have read on this site, recently Jill Funerus (bassist/vocalist for FUNERUS) who is also the wife of John McEntee from Incantation ran into a spate of health problems. In addition to battling neuropathy and diabetes, she suffered a heart attack and related kidney dysfunction, but has pulled through. We congratulate her on having survived such an intense health challenge. However, neither she nor her husband have health insurance and thus, they’re facing some intense bills for the surgery, medicine and several days she spent at the hospital. The metal community is banding together to help them. Through the hands of Brian Pattison, one-half of the Glorious Times team, a benefit show has been established with 100% of the profits going to Jill Funerus’ medical bills. If you can’t make the show, like many of us who are thousands of miles away, you can send money via paypal to info@funerus.com. If you are from a metal band or have something else you can donate for sale/raffle at the benefit, please message the Glorious Times team via glorioustimesdeathbook@gmail.com. See also the Facebook event listing. First, a quick update on Jill Funerus and her health challenges. She had 100% blockage in one artery and less in another, but the damage was still extensive enough to cause a heart attack and kidney problems. She went into surgery about 22 hours ago. However, she does not have health insurance and neither does her husband. Thus, she’s going to face some heft medical bills when this is all over. To counter those bills, the Glorious Times team have partnered with death metal bands across the world to throw a fundraiser. Bands will donate items for a raffle, and perform, with the proceeds going to Jill for payment of her medical bills. 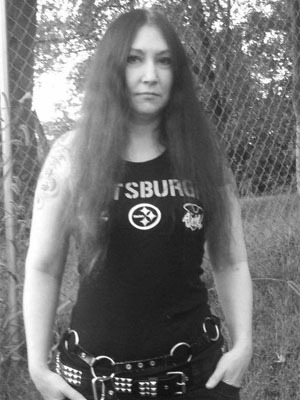 If you are a band, label or distro and want to help out with the Jill Funerus benefit, please send an email to glorioustimesdeathbook@gmail.com. Otherwise, check back here or on the Glorious Times Facebook. The book Glorious Times portrayed the experience of being involved in the early metal underground in a way that no one else has attempted before or since. It awakened in many of us a desire for such times again, when truth mattered more than commerce and popularity. Despite being initially scoffed at by publishers, Glorious Times exceeded all expectations and became a metal institution. The publishers, Alan Moses and Brian Pattison, have stayed active in the underground by promoting shows, writing reviews, and pushing forward bands that seem to have that sense of connection to reality that defined the early underground. As part of their continued activity, Moses and Pattison have released a profile of longstanding band Nuclear Death. According to Pattison, the material had been slated to be part of the first printing of Glorious Times, but for scheduling reasons was never part of that issue. Instead, it’s now available for free download thanks to the Glorious Times team wanting to update Facebook friends with a reward for their loyalty and continued attention to both Glorious Times and the underground. This multi-page spread features a unique story by Lori Bravo of Nuclear Death, previously undiscovered pictures from the era, and the classic zine-style layout which made Glorious Times a hit with the oldschooler crowd as well as new generations looking for an alternative to corporate media. One-time only rebroadcast of the streaming video of A Day of Death (July 16, 2011). Final chance to see the entire event. Whether you missed it or attended it and want to relive it for another day, you have one more chance to see Kam Lee join Druid Lord on stage, one more chance to see Kam Lee join Derketa on stage, one last chance to see Kam Lee perform “From Beyond” in its entirety. $10 via Paypal to glorioustimesdeathbook@gma​il.com (no later than Friday, July 29 at 10 pm est) link and password will be sent via email approximately 1-2 hours before the event airs. Grab some beers, invite the friends over and enjoy this once in a lifetime event, some of the bands of the day will be available in the chat room throughout the rebroadcast. plus a surprise or two thrown in for this special rebroadcast. For more information, see the FaleBook page. Some readers may have noticed the recent addition of a side bar promoting “Glorious Times – A Pictorial of the Death Metal scene (1981-1991)” and this inclusion is not without good reason. Laid out like the highly evolved Heavy Metal magazine we all wish we would see at the nearest news-stand, “Glorious Times” in true discriminatory fashion includes amongst its pages bands actually worth discovering and rediscovering, and although the layout is consciously rooted in the DIY mentality of early fanzines, this highly professional document provides a genuine glimpse into the workings of the early and mainly North American Death metal phenomenon. 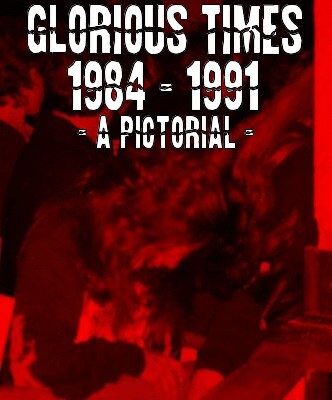 Providing a visual assault via rare and intriguing photos that both neophyte and seasoned veteran alike will find delightful, “Glorious Times” also includes entertaining and enlightening anecdotes by and about many of the foundational North American death metal acts. Although some of the accounts are funny, juvenile and downright adolescent, they remain above all inspiring, standing as a testament to the devoted individuals who were dedicated to an art form that for them was the last bastion of truthful expression in the time of “The Great Lie”. Given the “glory” of the documented time era we read thus with a slight sense of melancholy and loss, the release of a text such as this proving that these times have passed. With some misgivings we witness within ourselves a nostalgic longing for the mutual respect that those participatory individuals had for one another by virtue of their commitment to a common goal. We marvel additionally at the perseverance and DIY mentality of these restless and visionary artists, and commend their youthful and innocent intensity. We look fondly upon the early exuberance and the inherent excitement that permeated a movement that was giving birth to new and truthful forms of expression, but above all we witness and thus long for a genuine spirit of brotherhood and camaraderie such that now seems lost, although not dead, on the Hessian community. However, the potent power of a document such as this, its capacity to inspire, rally and excite may yet prove itself invaluable in infusing the Hessian community with the spirit with which it was once animated. The seeds are laid – Onward!